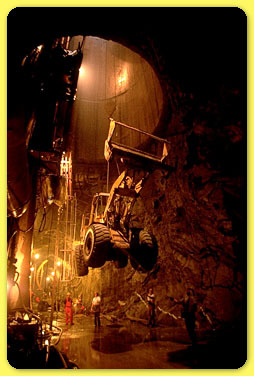 A 16-ton front-end loader is lowered into a tunnel with the guidance of sandhogs. This is the same tunnel where a miner was killed last year when he fell off a boring machine. Twenty-four workers have died since work on the water tunnel began in 1970. Hailed as a miracle in 1842, the city's first aqueduct was shut down in the 1950s.